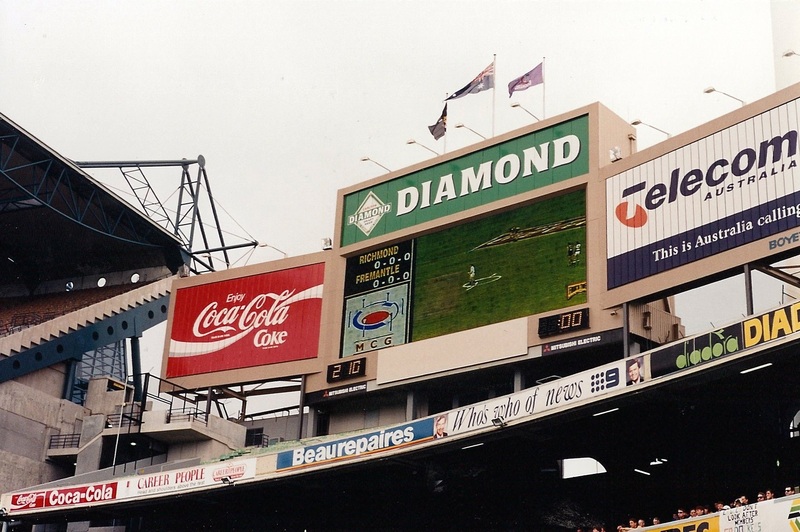 This entry was posted in Boots Happy Snaps and tagged 1995, afl, Brian Nailor, Footy, Fremantle Dockers, history, MCG, Ray Martin, scoreboard, Telecom, Telstra, West Coast by theholyboot. Bookmark the permalink. Interesting! Need to be picky about the “traditional” 2.10pm start though. It was 2.08 for ages, and 2.00pm before that. Strange to see an ad for Channel 9 in the stadium when the footy was shown on 7 – with exclusivity deals nowadays there’s no chance that could occur! And the old scoreboard… Am I right in thinking that was the one that burnt / caught on fire? 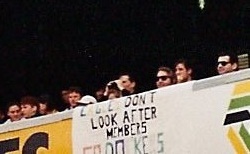 I was there that day, in the rain (and more rain, and more rain) in the old Northern Stand, and watched it go up (well, part of the screen anyway).